Asset search to determine if a person or company owns real properties in the Philippines. Trace history of the property and its title. 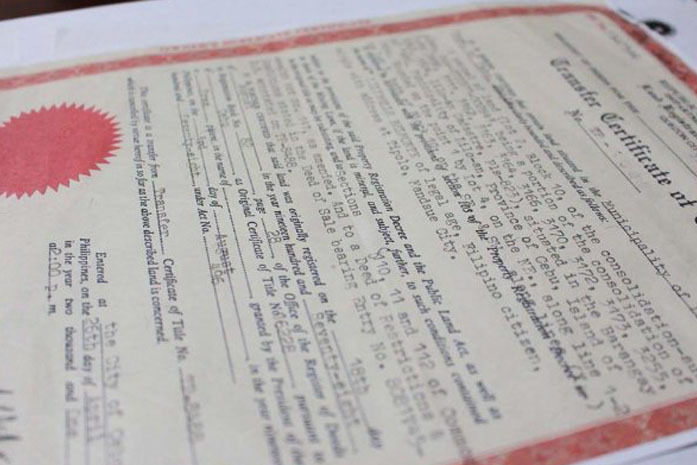 Obtain certified true copies of title to lands. Verify payment of real property taxes and obtain real property tax clearances. Determine a property’s assessed value and the improvements thereon, if any. Transfer of title through sale, donation, quitclaim, inheritance, partition, etc. Prepare contracts involving lands (e.g. deed of sale, contract to sell, deed of donation, deed of extrajudicial settlement of estate, and power of attorney). Assist non-Filipinos in legal purchase of condominium units. Recover payments made on canceled contract to sell real property. Obtain replacement for loss or destroyed owner’s title. Annotate or remove liens or encumbrances on title. File legal actions to recover title to or possession of real property. Ocular inspection of property to determine its physical condition.